I’m no stranger to the writing of Ben Tanzer. I know well the realism (though inventive) present in books like Repetition Patterns, You Can Make Him Like You, Lucky Man, and I Am. His new book, Orphans, made me curious though. I wanted to see what Tanzer would do with dystopian science fiction. “I said do you work here?” the guy says again, though I now realize he’s not just a guy, but one of many guys all trudging down the sidewalk and heading toward me; every one of them is dressed in what remains of their once professional suits. These are guys who used to have jobs, pride and somewhere to go before the Corporation took over, the E.C.s began to replace humans and the used Terraxes were able to provide help until no longer viable. “I do work here,” I say. They guy then reaches into his breast pocket and I get ready for the inevitable gun or knife. Instead he pulls out a resume, which is folded, and creased, stiff with coffee and sweat. As he goes to unfold it, a black helicopter swoops in from above. “We will need you to disperse please, immediately,” says the voice booming from the black helicopter, now so close I can feel the heat emanating from its belly. But no one is going anywhere. The helicopter rotates so one side is now facing us. A window opens and a mechanical arm holding a gun extends outward from the window and fires. The sound is so loud it echoes from across the buildings and down the street like a tidal wave. The guys in their tattered suits are now running in every possible direction. All but one anyway, because the guy who first confronted me is now lying on his back at my feet, a thin stream of blood slowly trickling from his temple, across the sidewalk and into the street. Within this world, Norrin Radd is desperately trying to support his family. He, like most, owes crushing amounts of money. By some means that he doesn’t understand and doesn’t really trust, he manages to get a job selling real estate on Mars. He will be gone from his family for very long lengths of time, but he has to provide for them. Also, a Terrax copy of Norrin will keep them company. Whether or not that is a good thing remains to be seen. I found myself really getting into the dark future of Orphans. However, the most interesting part for me was when I realized that there was more familiar than future in the futuristic dystopia. After all…do we not obsess right now about the power that corporations hold? Do we not worry about whether we really have opportunity or only the appearance of such? Do we not fear that the country has become a police state? It shook me a bit when I realized how similar this disturbing future was. Granted, these modern problems are amplified in Orphans. The economic distress and powerlessness are extreme. However, the real power for me in Orphans is how different the world seems when I start reading and how similar it seems as time goes on. Is Orphans a warning that presents alarmingly few solutions how we may fix the problems that concern us, presuming we aren’t merely arrogant in thinking we ever had the power to do so? “I think you may be confused Norrin,” Lebowski says reaching out and gently rubbing my shoulder, “I think you believe you have a choice in this, but you don’t. You may also believe that you can prefer not to, but you can’t. You were chosen, and it means a better life for your family if you keep it together. There’s no backing out though, regardless. You’re in it now. I’m not sure why this isn’t more obvious. You’re in it, and there’s no going backwards, only forwards, for as long as you can, and that’s all there is. Or, is it instead an exploration of these fears, projected in a distorted fashion so we can truly examine them without being hampered by our daily blinders? To be honest, I’m not entirely sure. There were things in me left unsettled after reading, but they felt like they should be unsettled. In any event, Tanzer presents an impressive book. I strongly recommend picking up a copy of Orphans and seeing for yourself. 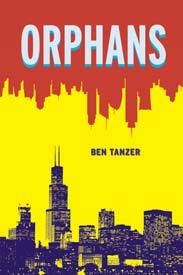 This entry was posted in Book Reviews and tagged Ben Tanzer, Book Review, David S. Atkinson, Orphans, Orphans by Ben Tanzer. Bookmark the permalink.